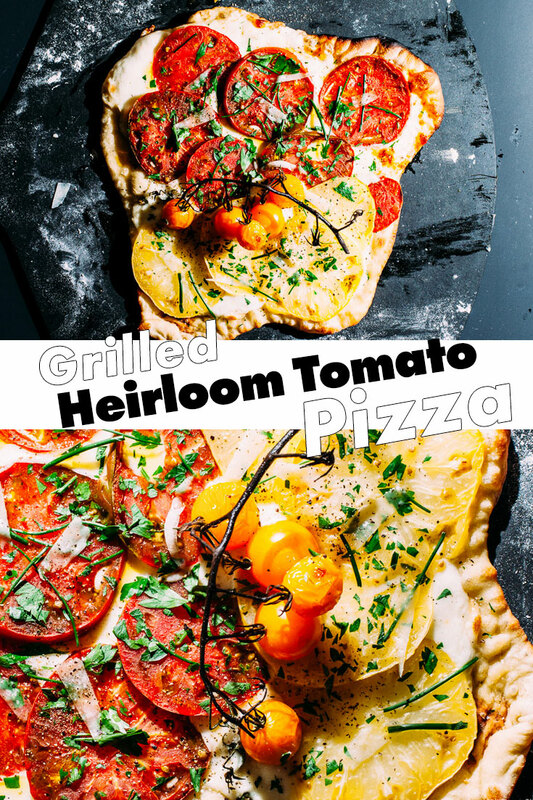 You will be amazed how your mouth just bursts with these flavors that become even more intense when grilled on top of a pizza. Simplicity is what this pizza is all about. 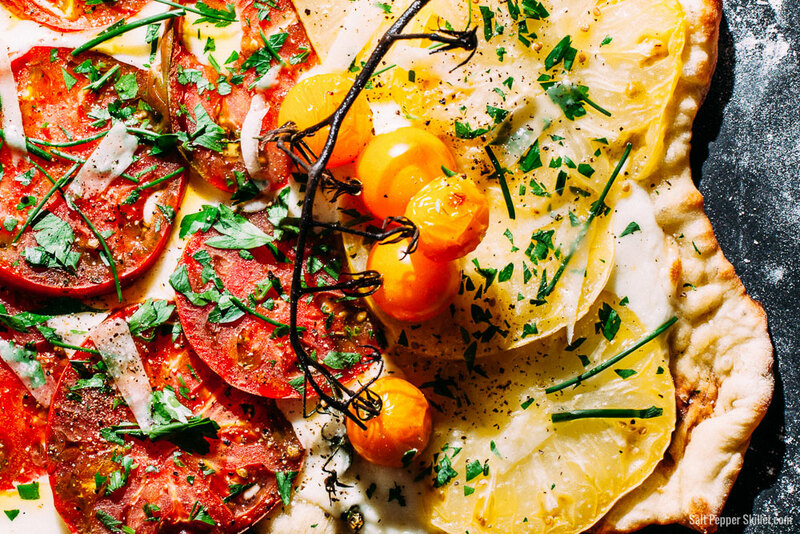 Mozzarella cheese, heirloom tomatoes, fresh herbs and a little drizzle of olive oil are all you need. Heirloom tomatoes are at their peak right now and I’ve been eating them with almost every meal. Whether it’s just eating them with a little salt & pepper, on a salad, in pasta or my favorite, which is on an open-faced sandwich with just a little mayo. 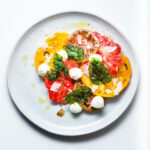 These wonderful tomatoes also happen to be fantastic on a simple pizza. 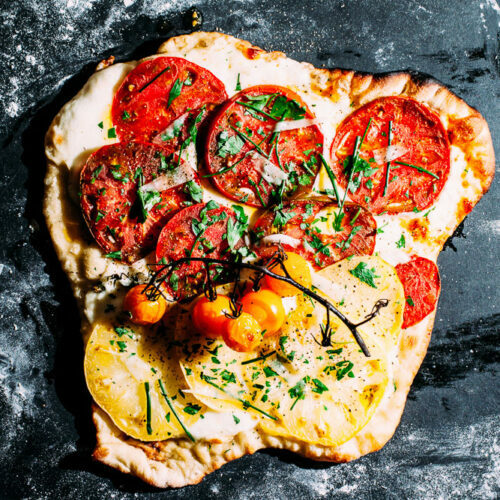 Making pizza can often seem a little daunting, but really, it can be compiled and ready to bake in just a few minutes when you use simple ingredients. Since your grill likely gets much hotter than your kitchen oven, using the grill helps you get a super crispy crust. Not having to crank the oven up is also a huge benefit during the hot summer months to help keep the house cool. I’ve posted a grilled pizza recipe in the past. This new one places the pizza onto a pizza stone that is on top of the grill grates, instead of the crust cooking directly on the grates. The stone method gives a little more room for error (not that you can really mess it up). 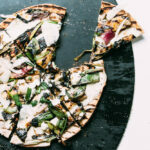 The recent Bon Appétit Grilling issue has some great tips about simple grilled pizza that inspires you to be creative. There are no rules, just some simple steps and you can build a pie that you will love. One of the keys is to not overload the pizza. You don’t need a ton of sauce, cheese or toppings. Too much will make the crust soggy and will make it difficult to eat. 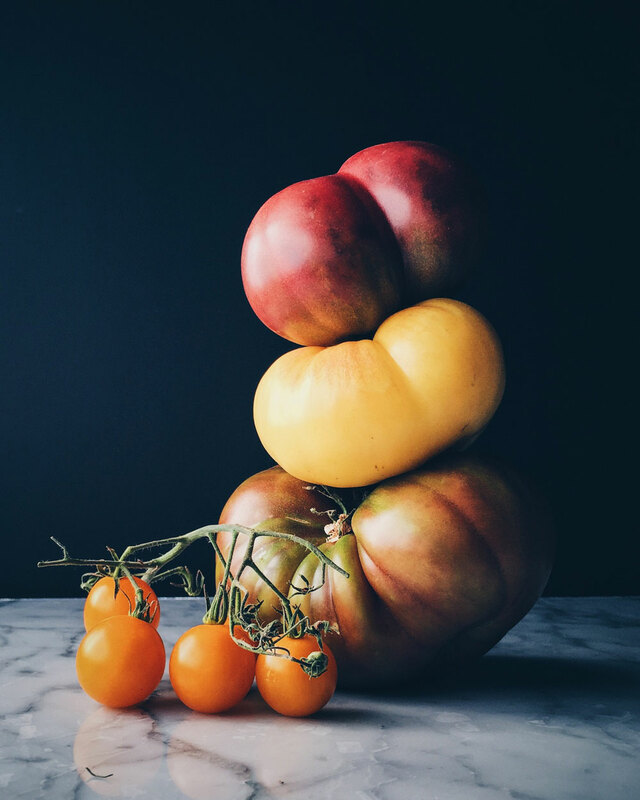 Heirloom Tomatoes have become really popular and are available all year long here in California. You can find them at your local farmer’s market, many grocery stores and at Specialty Produce in San Diego. Pre-heat your covered grill on high with the pizza stone directly on the grill grates for about 20 minutes. Rest the dough at room temperature for at least 30 minutes. Stretch the dough out onto a well floured surface or pizza peel/paddle. Carefully slide the stretched pizza dough onto the pizza stone. Add the toppings starting with a thin layer of cheese, then the tomatoes. Brush olive oil on the crust. Cover and cook for 8 to 10 minutes, or until the crust is crisp and cooked through. Carefully remove from the grill. Drizzle with olive oil, fresh herbs, season with salt & pepper, slice and serve. 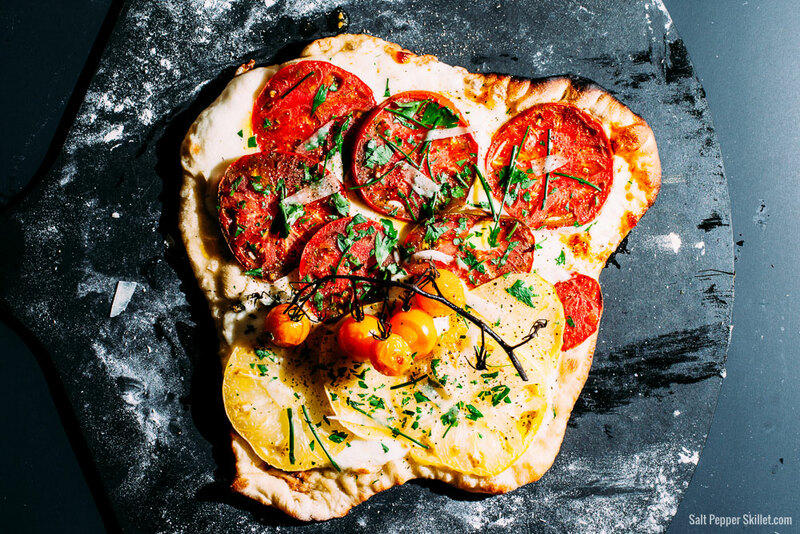 I use store bought pizza dough from Trader Joe's. 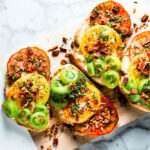 Nothing says Summer like Heirloom Tomato Toast with bacon, herbs, mayo, olive oil and seasoned with coarse salt and freshly ground pepper. Dude this looks absolutely awesome!